Of the many Aussie-developed games released in recent years, I've got to say that Hand Of Fate is up there as the most original, refined, and downright memorable. It was a delightful mix of action combat, choose-your-own-adventure style storytelling, and deck building card game. 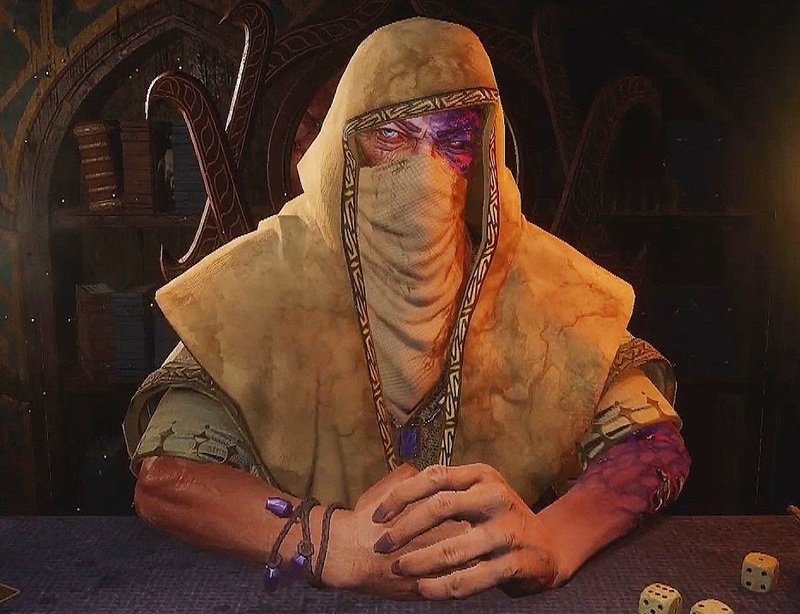 And then, last year at PAX, I saw the sequel in action, and well against my expectations (simply because the first was already exceptional), Hand of Fate 2 looks like a massive improvement on the original in every way. This game is going to be huge. So this week for the fast five we decided to have a chat with one of the developers on the game, Lee May. Matt Sainsbury (MS): What are you working on at the moment, and how's it going? Lee May (LM): I’m up to my neck in encounter edits for Hand of Fate 2, our hybrid deckbuilder-action RPG. People really resonated with our living boardgame concept and they certainly developed strong feelings about our antagonist, the Dealer, so the pressure is really on to deliver something that builds on that foundation in a meaningful way. I think people are going to be blown away when the game finally comes out. Our major pillars - our branching storytelling, our mission design and our combat -they’ve all undergone a dramatic transformation in HoF2. But there’s so much text, Matt. My god. Somebody told our designers to start writing the game, and nobody ever told them to stop. It has fallen on me, as the world’s foremost Hand of Fate aficionado, to ensure the sequel hits the same narrative tone as the original. Our story is like 180,000 words long, and I think I’m the only person who’s read them all. MS: What do you think about the state of the Australian game development industry at the moment? LM: It’s a challenging place - I think the shifting conditions make it difficult to do business and to create good art. The lack of state and federal recognition of our industry’s value, both culturally and economically, is still stifling growth. But it is encouraging to see a bunch of indie studios in a position where they’re expanding, undergoing new ventures, exploring their IP. It means we’re starting to construct an ecosystem that can support a greater variety of games and game makers. But I’d say we’re still a long way from stable. The people within the industry are something else, though. It’s an amazingly supportive community full of clever, conscientious folks. Everyone’s so accessible. Games people are good people. MS: What recent game would you recommend to people at the moment, and why? LM: I would be remiss not to mention Data_Wing, a fantastic mobile game by ex-Halfbricker, Dan Vogt. It sits in a very interesting space between F-Zero and Portal. It’s an arcadey, momentum-based racing game, but it’s also story driven? The whole thing is set inside a computer (possibly?) and you’re doing the bidding of a sarcastic overseer program. It is very, very funny, and it plays extremely well. It’s also completely free on iOS and Android. I guess Dan just wanted to make something excellent and give it to the world. I told you games people were good. My other go-to recommendation lately is What Remains of Edith Finch. It’s a game I keep buying for other people, if only so I can have someone to talk to about the scenes that completely messed me up. It’s a walking simulator - has the taint worn off that classification yet? You’re the last member of the Finch family, exploring the Finch mansion, and trying to understand the doom that follows the Finches by experiencing the final moments of your forebears. It’s beautifully crafted and very inventive. I don’t think there’s enough magical realism in games, either, we tend to be very literal, so I found the whole thing really refreshing. When it wasn’t breaking my heart, that is. MS. What's something you love about the general games industry at the moment, and what's something you wish would change? LM: I love that almost every day I see some new game pop into my twitter feed with a fresh aesthetic or a cool new hook. I remember seeing early development GIFs of Ooblets or Mineko’s Night Markets and just salivating with anticipation, y’know? Look at these whimsical storybooks come to life! I need them now. There’s a lot to not like in the industry at the moment, of course. Lack of diversity, constant harassment, devaluation of the product - but the thing that is specifically driving me up the wall right now is the transformation of every game into a slot machine. A bunch of stuff I’ve otherwise enjoyed lately has been spoiled by ill-placed loot boxes and leveling systems, insidious mechanics designed to turn players into addicts. It’s gross and insulting, and it really disrespects the player’s time. Random rewards are good, and levelling is fun, but it doesn’t take much to weaponise them against your player base. Yuck. LM: What kind of monster would I be if I said no? I want to live in a non-dystopian cyberpunk future as much as anybody else. So, yes. Japan’s singing girlfriend-made-of-lasers gets a thumbs up from me.